One Liberty Observation Deck is Philadelphia’s newest attraction! See Philly like never before from 57 floors above street level, providing amazing 360 degree views of the City of Brotherly Love and beyond. From up here you will enjoy incredible views of City Hall, Delaware and Schuylkill Rivers, Fairmount Park, Love Park, Ben Franklin Parkway, and Philly’s other top points of interest. At 57 stories high, the views of Philly can only be described as "Viewtiful"! Philadelphia, the first world heritage city in the US, is rich in history, culture and cuisine. 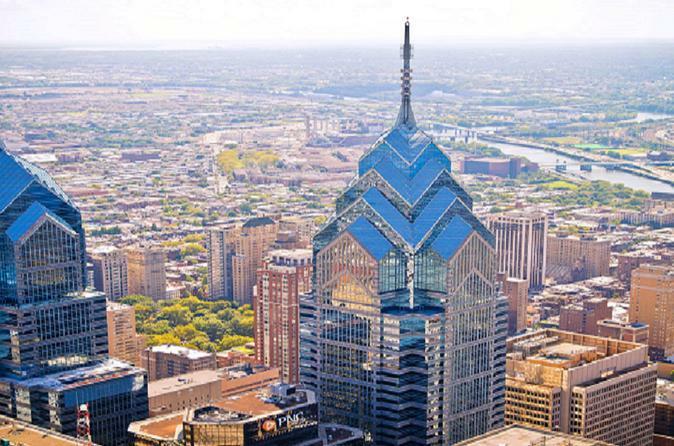 Located in the heart of Center City, One Liberty Observation Deck is within walking distance to all the major attractions such as Love Park and Constitution Hall and offers a once-in-a-lifetime view of the City of Brotherly Love. Upon arrival, you can learn about the city’s proud history and place in America as well as have plenty of photo opportunities. Get a closer look at key landmarks with our six touch screen monitors placed throughout the Observation Deck, where you can experience a high-definition look at noteworthy sites around the region. Available in English, Spanish, French, German & Mandarin. Free guided tours in English are available on the hour between 11am and 5pm (excluding 2pm) where you will learn about the history of the building, the history of Philadelphia, some of the major landmarks will be pointed out to you and you will be instructed on how to make best use of the touch-screens which give information and detail in the 5 different languages. These tours start at the Observation Deck level, so please aim to arrive at the building at least 15 minutes before the tour time if you wish to join these free tours. Special Offer - Book and save over 7% off local supplier's prices! - Book Now!